Recently built, 850 square foot stylish condominium with an open plan featuring a fully equipped kitchen with dining area, living room, 1 bedroom and 1 bathroom located in downtown Estes Park. Great place for your family vacation! Located just steps away from the Rocky Mountain National Park, the place provides a perfect combination of hiking, biking coupled with a quaint town that offers shopping, restaurants, brewery and art galleries. Relax and enjoy a marvelous mountain view from the spacious bedroom with a queen size bed and walk-in closet. 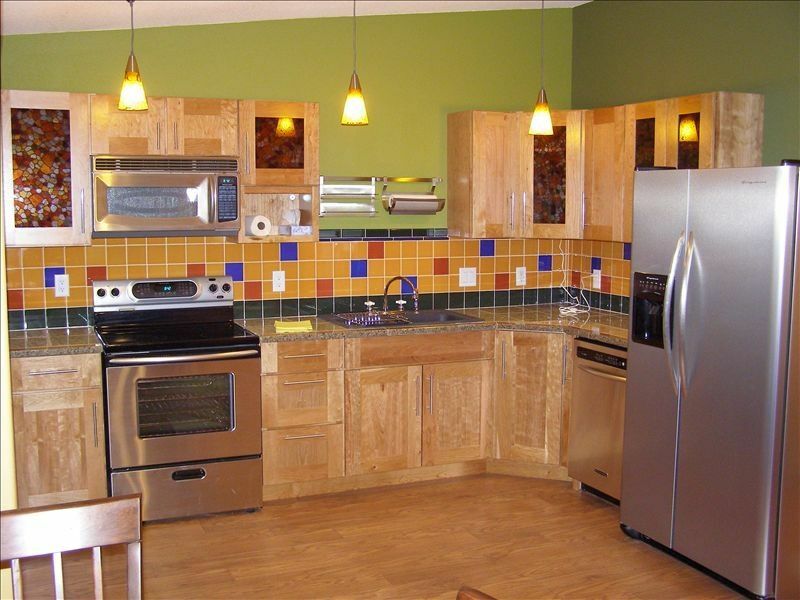 The kitchen is well equipped with granite tiled counters and all new appliances. The luxury bathroom is modernly equipped with ceramic tile shower and a glass sink. In addition to the 1 bedroom there is a full size sleeper sofa that accommodates 2 people. The condo can serve guests year-round. Summers in this area have been popular with tourists interested in hiking, mountain biking, rafting or horseback riding in the RMNP or simply shopping. Fall attracts visitors who come to area for the Scottish Festival or to view the beautiful changing of the aspen tree leaves. Winter offers cross-country skiing, ice-rock climbing or snowshoeing in the back country. Many art fairs as well as 4th of July fireworks party made the town a favorite destination for any season of the year. NOTICE THAT BED WAS REPLACED !!!!!! For the last 20 years together with my family I have been running a restaurant. We also specialize in smoked fish and meats. All products are made on premises and are available in our restaurant Villa Tatra as well in all Colorado Whole Foods stores. In the free time we like travel and sport activity. We chose Estes Park because of the fantastic location next to National Park and close distance to Denver and airport. The best benefit of staying in our place is location, location and ... You are in heart of Estes park with all the attraction in walking distance. The apartment was very nice and clean. It looked just as it does in the pictures. The location was great! We were there during the Christmas parade the day after Thanksgiving and the location gave us a front row seat. We walked all over town with very little effort. We had no trouble with noise or traffic. The bed was comfortable and warm. We would definitely stay there again. We had a great time the place was cozy and warm close to town. My son and I stayed here over a long weekend. The location was great. Parking was great. The condo was great. We had an excellent time. We loved staying at this downtown condo! It had everything we needed and the location can’t be beat. We highly recommend this VRBO. I love Estes Park, and would like to come enjoy the cool summer time temperatures every summer. This place does not have central air, and while they probably don't really have to have it, sleeping with an open window has two complications for me personally. My sinuses were really bad while I was there, because I am used to central air. Don't get me wrong, the open windows combined with the attic fan system does get it cool enough.I had to leave the attic fan on all night unless I woke up to go to the bathroom, and then I shut it off. I have to say the street noise mainly from motorcycles going up and down Hwy 36 is distracting, but the fan kind of drowns that out (it is loud in the living area). I did enjoy my stay but next trip I will probably stay somewhere with regular AC.